Having made their way from the small Danish island of Samso, Go To Team’s Clark crew continues their tour of Denmark in Nakskov on the island of Lolland. Audio operator John South booms an interview with HDNet correspondent Leslie Boghosian while producer Jennifer Wlach keeps everyone on time. 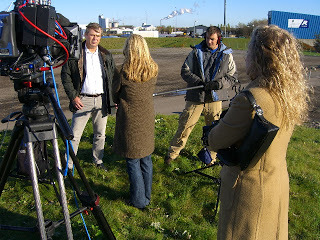 This interview was conducted in one of the biggest recycling plants in all of Europe and it is here that the residents of Lolland come with just about anything to have it recycled; aluminum cans, paper, old televisions and radios, even carpet, mattresses, and concrete! All of this is positioned right next door to Vestas, one of the leading wind turbine manufacturers in Denmark. Look below to see more about the wind turbines . . .